We can safely assert that only this fourth week since the beginning of the trial to the “procés” the actual trial has begun. We leave in the memory the statements by defendants claiming that this was a spontaneous popular celebration driven by the zeal for voting —no matter the law said— and statements by the state politicians and secessionists parties, to focus on the probing of material facts, which is always the aim of criminal law. The ones who personally lived through it there, have testified —the Secretary of State for Security openly declared himself responsible for the operation plan of the state; the members of the Bureau of the Catalan Parliament —from Ciudadanos and PSOE— who ended with Mrs Forcadell’s credibility; the Parliament counsels, who kept warning about illegalities and the resulting liability; the government delegate in Catalonia; the colonel Pérez de los Cobos, in charge of coordination of police operations; the Counsel of the Office of Administration of Justice, who was made hostage while performing her duty to enter and searching; the pilot of Palamós Port, who debunked Mr Rull’s alibi; the IT personnel who were going to fashion the electronic voting system; some of the contractors of the Catalan government for the referendum, who claim they were not paid; the chief of the National Police, who commanded the operations; the Lieutenant-General of 7th Command of Civil Guard and the chief of intelligence of the Catalan police, Mr Castellví. The issue of misappropriation will be examined later. Disobedience seems obvious. What today concerns us most are the statements by police commanders, including the Mossos d’Esquadra. At all times the police expected major violence if the referendum were to be carried out, as it was indeed the case. The people organized to prevent the police to perform their duty to enforce the court order banning the referendum. The access to voting centers at schools was not allowed, and sometimes it was not possible to get out of them with electoral material. Incidents of attacks to police and civil guards were described, and of course there were no civilian cooperation to obey court orders. Curiously enough, the accusation by the State Attorney omits entirely the presence of violence. Despite the warnings to Catalan government (to Puigdemont, Junqueras and specially Forn), and even a plea from the three police forces to call off the referendum on the face of a most likely violence, as they expected, the regional government categorically refused to do it, mentioning the “people’s will”. The Mossos betrayed the Civil Guard and National Police arranging procedures as if it was a normal voting, instead of one prohibited by court. They informed people on how to vote without being expelled and occupied the voting centers in advance. Some of them even engaged actively in the holding of the referendum, spied the other two police forces with the purpose of thwarting their law enforcing. Should they have stood on law’s side, the referendum would have not been carried out. The Counsel of the Office of Administration of Justice feared for his own life and safety. She went through moments of great anxiety being surrounded by crowds. It remains unknown the authority upon which the negotiations with the “Jordis” to leave the Economic Affairs Department building were carried out, under unacceptable conditions for officers and civil guards. The Mossos never offered their cooperation to carry out the search warrant and did not send the reinforcements demanded by the Civil Guard. She had to flee through the roof, leaving behind part of the confiscated items. 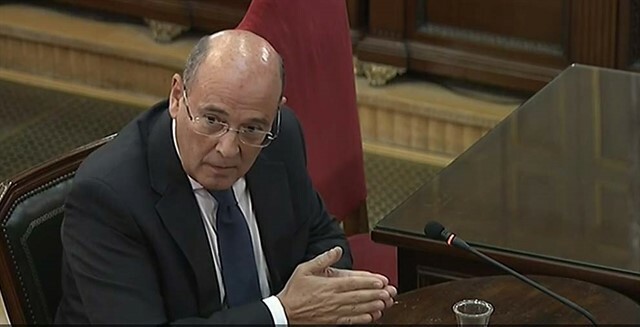 In the last of the testimonies last week, the former chief commissioner for information of the Mossos d’Esquadra stated that the president, vice-president and the regional minister for home affairs were informed that celebrating the referendum could generate situations of violence and that, despite this, they assumed its consequences. …someone behaves with malicious intent when, knowing that he is creating an specific risk which is legally disapproved, he still acts and continues the behavior that subjects the victim to a risk that the agent is not certain to be able to control and that, even if the goal is not directly to create a negative effect, must be understood as posing a high probability of causing it. This is one of the main issues of the trial: whether violence, if it is verified that it existed, was either directly sought, or was assumed as possible in order to achieve the independence. And that could be the key for the existence or not of the offence of rebellion. Finally, we would like to draw attention towards some interactions that we have seen continuously through the last week from the president of the Court, in order to ensure the smooth proceedings of the oral trial. In his capacity as director of the process, he has corrected and constrained the actions of both prosecutors and defenses, and even of those people attending as witnesses. The president is so performing what is called “police of the benches” in order to ensure the proper order of the process and as a guarantee of the right of defense. In this function he could even impose corrections to the parties (verbal warning or fines) if he understands that they are failing to show due respect to any participant in the process or that don’t obey his instructions. Actually, the president had already used this capacity, after consulting with the rest of judges in the Court, regarding the members of the CUP that refused answering the questions issued by Vox, imposing on them a fine of 2500 euros as well as sending a report of the events to the regular penal jurisdiction in case they might be considered a criminal offence. The limit of this function is the freedom of speech of the parties, as part of the right of defense. Some of the actuations that we have seen in the defenses seem to be trying to force this function of police to the limit of considering that it is constraining their right of defense, that is, to try in this way that the president oversteps in his function of controlling the process so that they can allege infringements of fundamental rights. This will be, for sure, one of the arguments that they will present before the Constitutional Court in case of being found guilty.